PET Rigid Film Extrusion Line success came in September this year when a line we supplied to market leading Mister Blister was a Finalist at the Plastics Industry Awards in London. Established in 1987, Mister Blister manufactures thermoformed blister packaging and blister packs for retail, catering and supermarkets supply chains. Their products have been widely used in various retail sectors throughout Europe for the past 15 years. They have invested in a Multi-layer PET Rigid Film extrusion line, supplied by UK Extrusion Ltd & manufacturer, Bandera. UK Extrusion took a design team from Bandera to visit the Mister Blister site and spent time gaining an understanding of the company’s production and crucially, of what they expected from the purchase of a new line. With a production line of this scale, it was essential that UK Extrusion was fully aware of where it would be positioned to be able to calculate height availability and space. They would need to be able to provide an effective conduit between the manufacturer of the line and their customer. 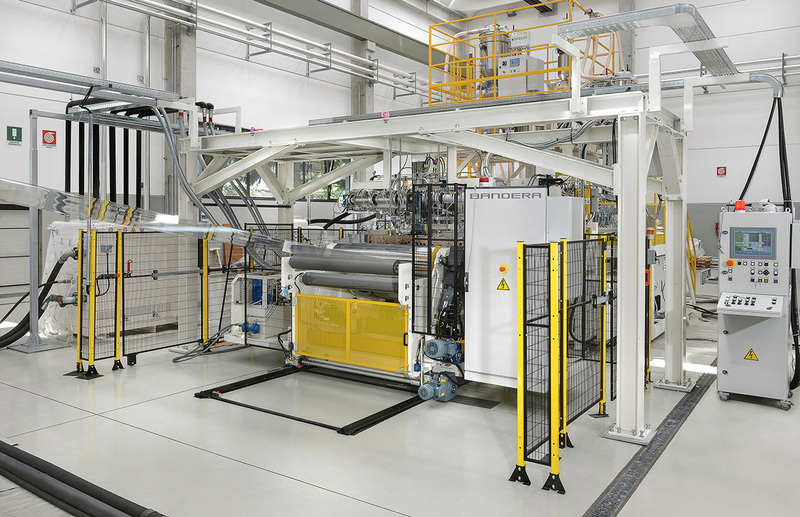 Luigi Bandera, the Italian manufacturer of UK Extrusion’s film and sheet lines, have invested heavily in an R & D centre. UK Extrusion was able to arrange for Mister Blister to visit this centre and all three parties worked together to design the elements of a Multi-layer PET Rigid Film Extrusion line which would satisfy Mister Blisters exact requirements and deliver the results they sought. The PET rigid film extrusion line is designed for the production of thermoformed packaging products, using PET: post-consumer bottle flakes, skeletal thermoforming flakes and/or bottle pre-forms in flake form and/or virgin material in pellets. Should the company wish to do so, there is also the option of producing C-PET, PET-G, PP, PS and PLA rigid film with no major technical changes to the extrusion line. UK Extrusion working with Luigi Bandera provided Mister Blister with charts and descriptions explaining every detail of what they could expect from the line in terms of layer composition and structures, thickness range, widths and throughputs. Clearly, there are a lot of sophisticated parts that go to make up a complete line and an understanding of these parts is highly beneficial to the customer. UK Extrusion and Bandera provided a detailed breakdown for Mister Blister and went through the details with their team to ensure they were happy. When the processing line was complete, Mister Blister were invited to Bandera once again to wet test the line before it was delivered. Accompanied by the team from UK Extrusion, who would be supporting the installation back in the UK, alongside the specialist team from Bandera, Mister Blister’s engineers spent 2 weeks at Bandera operating the line and running various thickness of sheet. This finished product was shipped back to Mister Blister for approval. Only when Mister Blister declared themselves satisfied, which was actually straight away, were arrangements put in place to deliver the line to their premises and install. Working with Factory Manager Ian Rylands, who had been overseeing the preparation of the site, a team of engineers from Luigi Bandera, supported by engineers from UK Extrusion began the installation. From start to wet test finish the operation took 4 weeks. The PET rigid film extrusion line was installed over a period of 4 weeks using initially a Bandera mechanical engineer, accompanied by a UK Extrusion engineer. After 3 weeks, the mechanical installation was complete. A Bandera electrical engineer then attended site, again accompanied by a UK Extrusion engineer for a period of 1 week. Once the electrical and mechanical installation had been completed a training technician spent 2 weeks running the line with Mister Blister operators and engineers until all had passed the rigorous training regime. Training certificates were issued to each operator and engineer. UK Extrusion and Bandera continue to support Mister Blister through the expected issues which occur after installation of a sophisticated, advanced technological, new line of this size. This support is often given remotely, either from UK Extrusion’s UK operation or from Bandera’s “Support Hub” at their HQ close to Milan via an internet connection. This has resulted in issues being resolved within hours, rather than days, which is often the case with manufacturers who do not have this facility. It has also reduced costs for the customer by avoiding the need for UK Extrusion to arrange for Bandera engineers to visit site. Gary Briscoe commented “One of the clear advantages of working with UK Extrusion is the unique access to a UK based engineer which results in a rapid response. The line is producing an average output of 660 kg/hr and Mister Blister expect to produce 2000 tonnes of material per annum. The majority of this material is earmarked for their own production, but excess sheet that is produced is sold on to other thermoformers in the UK, helping to raise additional revenue for the business. A number of these thermoformers have been identified to the company by UK Extrusion connections throughout the industry. Mister Blister have also made a commitment to source their rPET material from UK suppliers to lower their carbon footprint in response to the Blue Planet documentary regarding plastics.